Like many of you, I’m finally recovering from the one-two punch of Dreamforce ’15 and the end of Q3. Now that my head is above water, I want to highlight one Dreamforce product launch you might have missed: SalesforceIQ for Sales Cloud. I’ve been playing with the app for a few weeks and am totally blown away. SalesforceIQ for Sales Cloud is both a mobile email client (iOS and Android devices) and a Chrome browser extension. The product marketing promises: sell smarter right from inbox. They aren’t kidding. 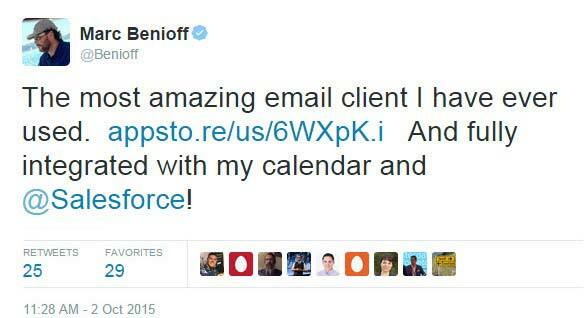 It is part email open tracker, part cloud calendar scheduler, part Salesforce integration, and part automated assistant. I shot a quick video walk-thru to give you a feel for the app. One piece I forgot to record in the walk-thru is tasks. When sending an email, you can set a reminder for tomorrow, next week, next month, etc. If the recipient hasn’t replied by then, you'll get a reminder. That feature has already proven extremely useful. I’ve just started using the Android app and some of the same features carry over there: create lead/contact/opportunity, log to Salesforce, short codes, email open notifications, set reminders, etc. SalesforceIQ for Sales Cloud is still in (free!) public Beta with pricing to be determined. I’m a huge fan of the app for people like myself who often play calendar battleship and want to quickly log emails and create new contacts without leaving gmail. For high-volume prospecting reps (SDRs, LGR, etc. ), I’m still a Yesware fan. The capabilities around mail merges, team template reporting, and attachment tracking analytics are hugely valuable. Give it a try for yourself and let me know what you think.